Bathrooms aren't always the most exciting rooms in the house. 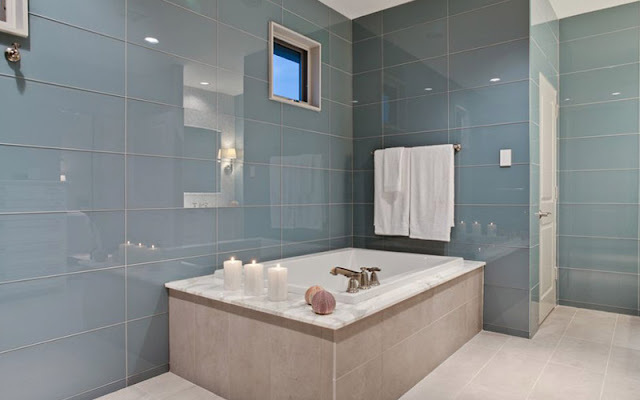 Often small, cramped and functional, bathrooms tend to get some basic white ceramic tile for the floor and then the homeowner moves on to other areas of the house. However, with a little attention a bathroom can be a peaceful retreat. Even a small hall bath can be a fun, personal statement of your personality. Bathrooms may not always get a lot of attention, but when you see the options available - you'll want to give them a second look. Kermans Flooring in Indianapolis has a full range of tile and other flooring products just right for any bathroom - and any budget. Durability. Water resistant. Easy to clean. These are usually the top requirements for a bathroom floor. You can have all of those things and a bit of fun too! Let's explore some bathroom floor (and wall) trends and learn how Indianapolis flooring store, Kermans, can help you pull them together. Go beyond traditional ceramic: Yes, ceramic tile is an excellent choice for a bathroom. It's long lasting and easy to clean. Even better, you can get ceramic tile in all shapes, sizes and colors. You can even find ceramic tiles that mimic other stone tiles for a distinctively different look. Break out of the box: Who says your tile has to be square? You can incorporate angles or shapes by using a mix of tile sizes. Small mosaic tiles, in particular, can be used in a wide variety of ways to create a one-of-a-kind tile floor. You can also mix and match types and sizes of tile to create your own distinct look. 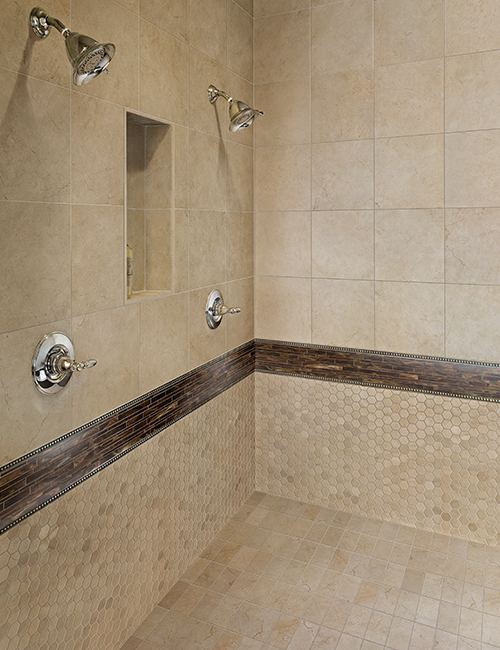 Radiant heat: If you're putting in new bathroom tile, consider radiant floor heating systems. They create a warm surface to step and can be especially nice on a cold winter's day. Learn more about radiant floor heating. Luxury vinyl: Vinyl is making a huge comeback. Why? It's budget-friendly, durable, low maintenance and soft underfoot. 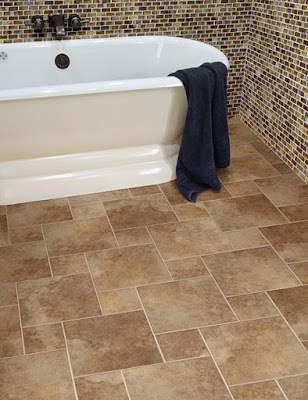 Today's vinyl also mimcs the look of more expensive porcelain, stone or hardwood. Luxury vinyl can brin gan elegant touch to your bathroom without breaking the bank. Read our recent article about luxury vinyl. Wood floors: Wood in the bathroom? You bet! Laminate wood floors have a moisture-resistant surface that makes them an excellent option for your bathroom. Laminate wood floors are also very durable and will look great for years to come. Another great wood option for your bath? Naturally mold and mildew resistant cork! Look up: Tile isn't just for floors! Glass tile in particular is becoming a very popular choice for bathroom walls. It offers the same easy cleaning style as tile floors and the natural shine of glass can help a small room look bigger. There really are a lot of options beyond traditional, white ceramic tile for your bathroom! Make an appointment with one of Kermans free design consultants and we'll show you these trends and more!